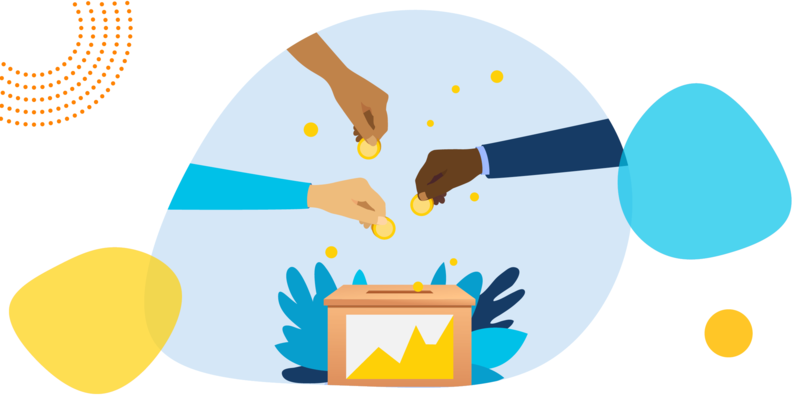 Editor's note: Each year in the spring, the cause digital marketing firm M+R publishes its famous benchmark studies on U.S. nonprofit online fundraising and marketing trends. Sign up to get their free Benchmark Study later this month. This article, originally published here, is a preview of their findings. We thought them so important and surprising that we're reprinting the article here by permission. This is part of TechSoup's ongoing coverage of the giving plunge. The story so far: nonprofits experienced a somewhat rocky end-of-year fundraising season in 2018. Sure, there were some bright spots, but plenty of mixed results and mixed feelings. The preliminary data left us with more questions than answers. Did the new tax law impact giving for any or all donor segments, particularly mid-level givers? Did the recent turbulence in the stock market lead donors to be more conservative in their giving? Was 2017 such a strong online fundraising year for many organizations that 2018 was a return to "normal" for some or many groups? Did political fatigue affect giving (especially for politically oriented organizations)? Did the increased focus on Giving Tuesday decrease December giving? Let's start at the beginning (of our list). The burning question on everyone's mind going into the biggest charitable giving season was around the tax law: Now that fewer people benefit from the tax deductibility of charitable donations, would people just … stop giving? If the changes to the tax law made a difference, we would expect that impact to be felt more strongly among donors who are likely to be itemizing their deductions. 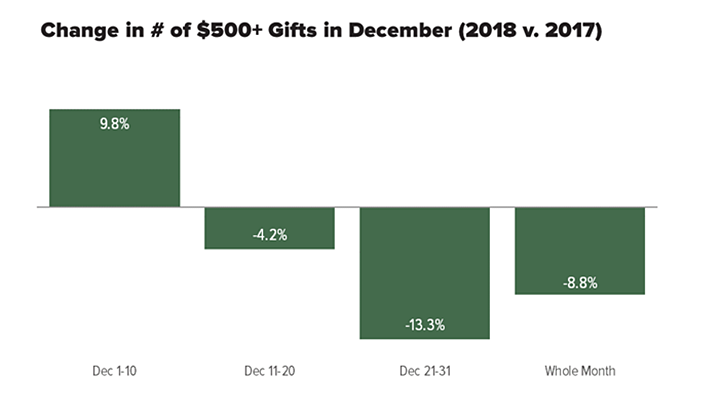 We can't access that information directly, so we analyzed the change in the number of $500+ gifts made in December 2017 and 2018. Our sample included more than 50 nonprofits of a variety of sizes and issue areas. 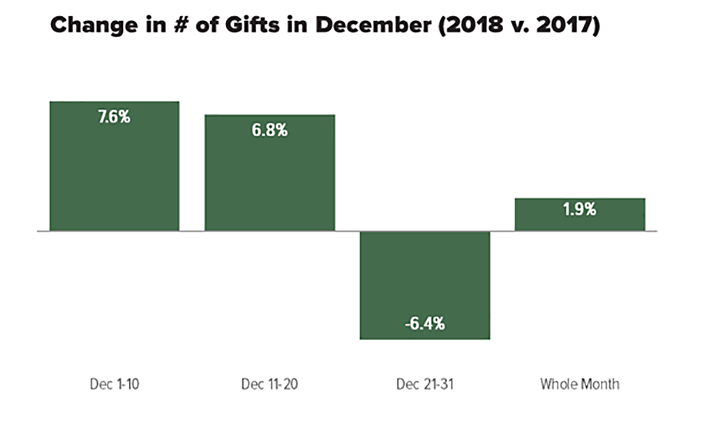 Overall, the median group saw a 9 percent drop in the number of $500+ gifts in December year over year, concentrated primarily in the second two-thirds of the month. This is suggestive, but not definitive proof that the tax law motivated these donors to give (or in this case, not give) this year. 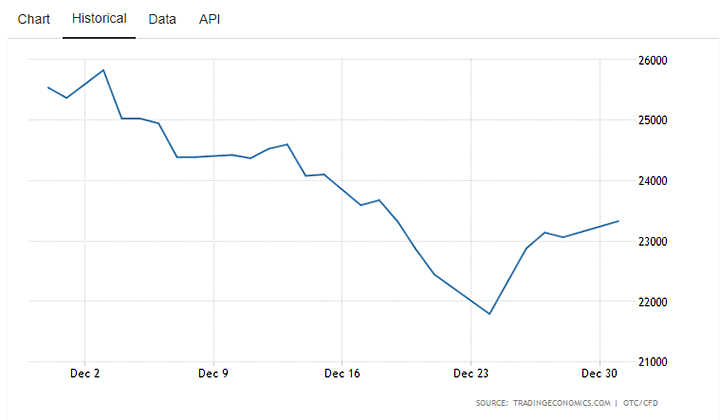 It's worth noting that the stock market was also having a … moment during end-of-year as well (more on that in a minute!). And, well, people are complicated. When donors were asked why they gave in 2017 but not in 2018, answers were all over the map. Some donors said they no longer had the means to donate. Others mentioned the frequency of solicitations they received; still others mentioned the infrequency of those same solicitations. We heard from donors who didn't approve of the political nature of a nonprofit organization's messaging, and yes, more than one mention of the tax law. So, there is some evidence that suggests that mid-level and higher donors scaled back their giving as the tax incentive went away, but there's probably more to it than that. And it's also true that we've seen nonprofits make substantial improvements in their mid-level programs even in the wake of these changes. Individual strategy can certainly overcome general trends. It's also worth keeping in mind that if you're relying too heavily on tax incentive messaging in your end-of-year fundraising, you might see less of a return as certain pools of donors are no longer impacted by those incentives. Starting right around December 15, the stock market took a tumble, and giving seemed to take a tumble right along with it for our participating organizations. The median group received 6 percent fewer donations in the last 10 days of the year than they did in 2017. Even though the market started to pick up in the last few days of the year, the damage was done. A small note about math here: The overall number of gifts was up for the median organization (barely), but revenue was still down 9 percent year over year for participating organizations. 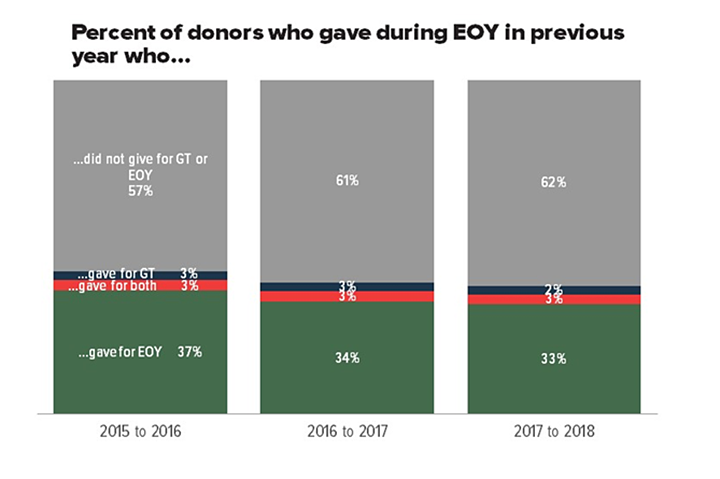 This corresponding dip certainly supports a theory that decline in giving had something to do with the decline in the stock market, but of course these donors could also have been more motivated by tax incentives in past years. As is so often the case, a clearer picture will depend on more data. The tax law is here to stay (for now), so moving forward we'll have a chance to see if changes in donor behavior continue to track changes in the markets. Did the Trump Bump Hit a Slump? Has the enthusiastic outpouring of support from donors in response to the 2016 election finally come to an end? Are we returning to normal? What is normal anyway? We sent our time machine all the way back to end-of-year 2014 to gather a baseline and measured every end-of-year since as growth against that baseline. This chart includes Giving Tuesday in all sets, represented as November 27 – December 31, to control for Giving Tuesday jumping from December to November in 2016. 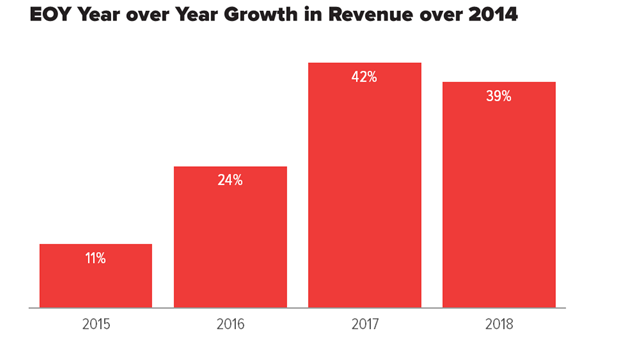 This chart shows the growth of end-of-year revenue each year, compared to 2014. So end-of-year 2015 generated 11 percent more revenue than end-of-year 2014, 2016 generated 24 percent more than 2014, and so on. In this broader context, it's 2017 that looks like an outlier, with an extra-large jump very likely driven by the changed and charged political landscape. 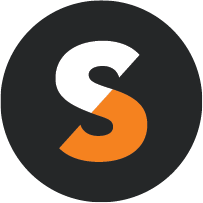 This tracks with our experience working with nonprofits who tend not to lean in to political fundraising, such as those in the international, wildlife and animal welfare, and health sectors. Generally, these nonprofits seemed to experience less of a peak in 2017 and then less of a cliff in 2018, with some of them reporting significant or modest growth in 2018. But that's just anecdotal: We'll have our regular sector-by-sector fundraising breakdown ready for prime time in Benchmarks 2019 this April. Yes — there is some indication that this is a return to normal, and that when groups project for coming fiscal years, 2017 should be treated akin to an emergency year. That is, the revenue was nice to have when it came, but it's not sustainable, and we can't count on an "emergency" every year. What About Attention Fatigue? Aren't There Emergencies ALL THE TIME Now? And what about the donor fatigue that comes along with that? This is the one that gets tricky to prove (or disprove) with data, since there are so many other variables at play: how did world events shape the landscape for different groups? Were there factors beyond Trump that could have played a part in a 2017 bump (or lack thereof) such as hurricanes, famine, scandals, bad press, that thing where Warren Beatty said that La La Land won Best Picture but actually it was Moonlight , technical and deliverability challenges, and more? Unfortunately, the data is still crunching for our full Benchmarks report. (Have I mentioned it comes out in April? Have I mentioned I am excited?) As of now we're not quite ready to share trends in response rates, message volume, or overall donor retention — the metrics that might shed some light on trends in donor behavior. "But wait!" you say. "Isn't there a good chance that our trusty, reliable end-of-year donors are being swayed by shiny #GivingTuesday promotions and abandoning us in our time of end-of-year need?" If I had a nickel for every time I heard this as a possible explanation for declining end-of-year returns, well, I'd put those nickels into the little overflowing bowl of change that I keep by my front door because who wants to bike to work with a pocket full of coins? But thanks to detailed transaction data from more than 50 organizations, we can honestly say: Nope. That's not true. This isn't to say that they don't give during other parts of the year, but it is suggesting that the pull of that "same time of year, same type of gift" isn't as habit-forming as it may have been in the past. The data also shows that even though Giving Tuesday has seen a meteoric rise in the past three years, the proportion of donors who move from one bucket (end-of-year donor) to another (Giving Tuesday only donor) is staying relatively steady. And tiny — 2 to 3 percent. So no, last-chance-December-deadline donors are not turning into Giving Tuesday donors in droves. We all want one thing to point our fingers at and say, "Yes, THAT is the reason end-of-year was the way it was." But as we now know from all of this beautiful data, that's impossible. It was a cluster of events, right on down to the conspiring stock market in the waning hours of 2018. It does, however, feel good to have some closure on those haunting questions. Yes, the change in tax law seemed to have some impact, though its effect cannot be completely separated from the stock market volatility during the final weeks of the year and may have even been compounded by the stock market. Yes, the stock market trended downward right at about the same time that the donations began to slow as well, and that effect might also be compounded by the changing tax law. Seeing a pattern here? Yes, 2017 seemed to be an extraordinary year for fundraising across organizations, especially ones that leaned particularly heavily into fundraising around the Trump administration and various global emergencies, and 2018 seemed to be a return to normal. Or whatever normal is these days. Jury is still out on whether donors are especially fatigued this year by the sheer number of urgent issues demanding their attention, which could be reflected in lowering response rates and increased message volume. It's hard to separate that from other issues, and we just need to crunch more data. Sign up to be the first to know when Benchmarks launches this spring. No, Giving Tuesday is not poaching all of your end-of-year donors and dollars. But you're probably going to have to work even harder to get your end-of-year donors to retain during end-of-year next year. Yes, technical challenges had something to do with revenue trends during end-of-year, but it's not what you'd expect. Go read more in our first end-of-year post. No, email is not dead. There's a section in our first end-of-year post on this too. Thanks for sticking with us through all the twists and turns of this December fundraising analysis. And guess what: We'll have plenty more analysis and insight in a few weeks when we release our full Benchmarks Study. Karen Hopper is the Washington, D.C.–based senior data strategist at M+R. She is experienced in helping nonprofit organizations recruit more supporters, generate more revenue, and create lasting change.